People ask us how we can offer a lifetime warranty on our products. Simple. We know our products are good because that's how we make them, that's how we test them, and that's how we ship them. We do not cut corners where quality is concerned. For one thing, we start out with quality conductors and high-grade materials. This is one of the major things that differentiates us from the competition. 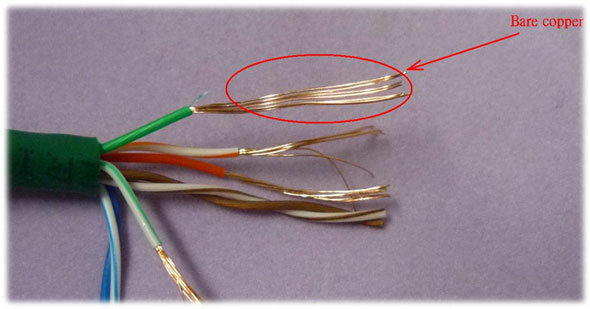 Bare copper is a more efficient electrical conductor than CCA. CCA cables need heavier gauge (larger) wire to achieve the same Cat5e cable rating (350 MHz). Bare copper is more durable, making it more resilient to jerks and pulls when the cable is going through tight corners and around sharp edges. 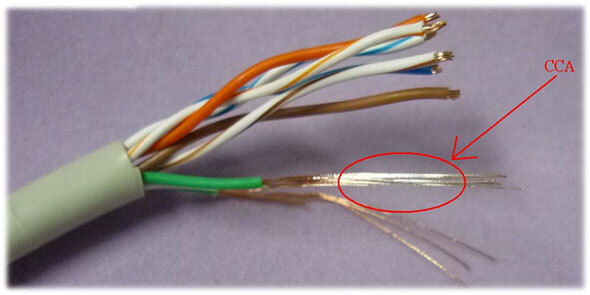 Bare copper causes less electrical loss, which is important when cables are run over long distances. To properly carry a UL listing for Cat cable, it has to be pure copper. At CableWholesale we check all our products three times. The first inspection is at the factory. Before the product is sent to our warehouses, we have a third-party company (independent of our factory) test to make sure everything is to our exacting specifications. They'll test everything from the amount of copper, the thickness of the conductor and the percentage of braided shield to the pinouts and the colors. Once we receive these parts in our warehouses, we check features such as jacket markings, connector moldings, proper labeling and dimensions again. We do not hesitate to break out our calipers to ensure our size requirements are met down to the micrometers. Our third check is a visual inspection after the parts have been pulled and are being prepared for shipment. We do a final run down of your order and ensure the parts meet our standards before we send them to you. Some of our tests might surprise you. For one thing, we stress test the jackets on our bulk cable to make sure they do not leave unsightly stretch marks. This does not affect performance. We just don't want to put our name on a product that doesn't look as good as it operates. We even get a little crazy about the RJ45 boots. Are they too stiff? Too squishy? It might seem trifling but it's just the way we do things. We test our products carefully so that you can buy with confidence. Here comes the tricky part: We actually ship exactly what you've ordered. This should come as no surprise, but we know of cases where other companies do not ship what's been ordered. Some companies make different grades of a product and show the best one on the website. If the customer wants a lower price, they substitute a lesser-quality, cheaper version, often without notifying the customer. Some of these products might not even qualify for the UL rating. Here are some ways manufacturers can offer a cheaper product that looks the same but is not. Bulk cable is one of the biggest offenders. The length and color match, but the similarities end there. Some cable manufacturers use inferior conductors such as CCA or CCS (copper clad steel), where only copper should be used such as on bulk cat 5/6 cable. (see pictures below). Another problem is the twisting of the pairs. The more twists and the tighter the twist, the more cable is used. Manufacturers will slacken the twist, which potentially causes interference problems. Another way is with the shielding. The foil will be skimped on and not even completely enclose the pairs, or the mylar will be left off to save on materials and production times. On coaxial cable, the braid shield will be a much lower percentage, again all to save materials and bring costs down. There are many ways that manufacturers save money and offer a cheaper product. We have highlighted a few here. The Underwriters Laboratories are the World's largest not-for-profit product safety testing and certification organization, they are responsible for products getting that little UL on them. Unfortunately there are companies that try to skirt such safety groups or outright lie about thier products passing tests. Fortunately the UL website publishes stories/warnings when they discover such transgressions. Here at CableWholesale we take UL certification seriously unlike others. The jackets on our bulk cable are stress tested to not leave unsightly stretch marks. This does not affect the performance of the cable. It is just something we do not like to see on items we put our name on. Another example is ensuring our cat cable pairs are marked well with easy-to-identify jackets. We always spec our cables to have a colored stripe on the corresponding pair to make it easier to identify (e.g., orange is twisted with an orange and a white with orange stripe.) We even get a little crazy about the RJ45 boots, are they too stiff? Too squishy? It might seem trifling but its just the way we do things. We will deliver on what we promise our customers. With other less reputable suppliers, you may be left hanging without warning. Do you want to risk that?